What a busy morning we had! First up Juniordwarf went to his swimming lesson. 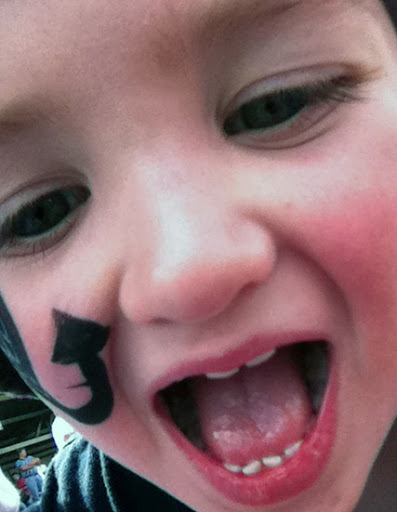 Then he and I went to an Xmas party at his daycare centre, where he got his face painted and his nails done. He went on the jumping castle and went for a train ride. He saw Santa, somehow ended up getting two bags of lollies, ate sausages and ice cream, and was very reluctant to leave. But we had to leave, because I wanted to go to the Family Fun Day hosted by the Local Enabling Group for our Child and Family Centre. Today was the official ‘site celebration’ prior to the construction of the centre beginning. Early last year interested members of our community were asked to nominate for what is called a Local Enabling Group (LEG) to oversee the development of a new Child and Family Centre in our town. The Tasmanian Government has provided funding for a number of Child and Family Centres to be built across the state to support families with children aged 0-5. The aim is “improve the health and well being, education and care of Tasmania’s very young children by supporting parents and enhancing accessibility of services in the local community”. Each community established a LEG, under the direction of a Social Inclusion Community Liaison Officer. The LEGs are made up of different community members: parents, representatives from organisations that provides services to children in the area, community members, local council officials – people who are interested in the project and who are prepared to contribute their time to participate. You can find out more about the Child and Family Centres Project here. Last year Juniordwarf and I participated in the LEG through the initial stages of the project, the main focus on which was selecting the location for the centre to be built, as well as doing a lot of work on the objectives and aims for the centre that suited our community’s needs. It was a great project to be involved in and a lot of people from our area were keen to participate. Having been involved in some, um, interesting groups through work, I wasn’t sure whether it was all going to come together. But I had no need to be worried at all. I was really impressed with how such a large number of people – I think we were the largest LEG in the state – worked together over the year, and focused on the primary purpose of the centre – supporting children and their families. For me, as a government employee, it was a fascinating experience to participate in a community engagement process as a community member rather than as a government official. The two biggest decisions we made last year were the site for the centre to be built on – which generated a lot of discussion, but after considering all the pros and cons of the other options, it was a very easy decision for me on which site to vote for – and the vision statement for the centre: “Happy healthy children thriving in our community”. Unfortunately this year I had to go back to work on the days that the meetings were normally held, and I was only able to attend one meeting. I’d hoped I’d be able to juggle working from home at least once a month so I could still go, but it didn’t work out that way. Even though I haven’t been involved this year, I’m still very excited about this project. I think it will be a great asset for our region, and I can’t wait to see how it develops over the next few years. We missed the official part of the day with all the speeches, and when we arrived it had just started to rain, so some of the activities didn’t go ahead as planned. This is what we saw when we arrived. It was a bit wet, and people had run for cover. Slabs, Juniordwarf and I presented ourselves at the Kombicam photo booth and had some silly photos taken. It was good to catch up with some of our friends from Communities for Children, who have been a valuable source of information, support and friendship for me and Juniordwarf, especially during his first four years. And I would like to thank Peter (I think that was his name) from Coffee Tasmania for replacing Juniordwarf’s hot chocolate at no charge after the inevitable happened when a small child is carrying a warm drink over uneven terrain. Thank you also to the LEG members for organising the day. I’ve missed being involved with the group this year, but am eagerly waiting to see what happens next. Juniordwarf’s school had a student-free day and it was my turn to have a day off to spend with him. When he found out he’d be having the day with me, Juniordwarf planned out the ‘special acitivities’ that we’d be doing – making a Father’s Day card for Slabs and drawing a picture of a dragon for me. Last week I saw a poster for the annual Big Playgroup, to be held at our local library today, so I asked Juniordwarf if he wanted to go. He was very excited about going, and added that to his list of special activities. A few weeks ago, the mum of one of his school friends (who I will call J) asked if Juniordwarf would like to go to their place to play with J, She said Juniordwarf was always concerned about J when he was sad at school and that he was a really good friend to J.
We’ve tried to organise this for several weeks, but something’s always come up. I thought today might be a good chance to do it, because we didn’t have any thing to do after Big Playgroup, so we tentatively agreed on the day. I said I’d call J’s mother after Playgroup and let her know how we were going. We walked in to the library and it was packed with kids. Juniordwarf was a bit overwhelmed at first, even though I’d warned him that there would be lots of kids there and it would be noisy. He’s used to a quiet place with only one or two people there. I felt sorry for anyone who didn’t know it was on and went to the library to browse some books. He wandered round a bit, but wasn’t interested in doing any of the activities. That is, until he saw the play dough. He made a bee-line for that, and did his usual thing of making a cake for me. But things have progressed – now he puts the cake in the oven and cooks it, before he gets it out (with an oven glove), lets it cool, ‘icings’ it and then gives it to me. I asked him if he wanted to do some of the craft activities, which were set up in a side room, but he got quite upset and didn’t want to go in there, so I didn’t push him. The Grade 6 kids from one of the local schools were there helping out. A couple of them were doing face painting, and Juniordwarf freaked them out a bit when he asked for a butterfly. He wanted one on each side of his face, but I convinced him a spider tattoo was a better option. The dental service people were there, so I encouraged him to go and say hello to the dentist and practise his brushing on the giant teeth. There were some cool strap-on cars that Juniordwarf had a great time with. He ‘drove’ all over the library, going to various shops, getting out of the car, doing the shopping and then driving off to the next shop. He got a balloon, and spent a lot of time letting it go and watching it float up to the ceiling (which I then had to get down for him, so he could let it go again . . .). We went outside to the sausage sizzle, and after that he finally wanted to do a crafty activity, which was to build a little wooden car. We built it together and then he decorated it. The last thing we did was to go into the craft room and make a card for Slabs. But I can’t say anything about that . . . shhh! Juniordwarf didn’t want to leave, but it was pack-up time and I asked if he wanted to go to J’s house. He was still keen, so I called J’s mother and she said to come over, so off we went. We had a couple of things to do on the way in and said we’d be there about 1.30. When we got there, J’s mum said that J had been so excited that Juniordwarf was coming that she’d had to set the timer for him. The boys had a great time playing and (wouldn’t you know it) when it was time to leave, Juniordwarf didn’t want to go. But I told him we could come back another day and he reluctantly cooperated. I told him we could go out for ice cream before we went home, so we did that too. He had ‘white ice cream’, which he loved. He was also very excited about being allowed to put the money in the parking voucher machine, and wanted to put more money in when we were leaving. Um, no, I don’t think so! It took a lot to convince him that this was completely unnecessary. Despite all his little refusals during the day, it was one of the best Mum and Son days we’ve had for ages. Juniordwarf and I went to Anglicare’s Family Fun Day. he went on the jumping castle and he got a green dinosaur balloon from the balloonist, The Amazing Chris. The event was also a promotion for Anglicare’s Mental Health services so everyone who attended was given a goody bag that included information from Anglicare and beyondblue: the national depression initiative about services available for people with mental health issues and strategies for dealing with these issues. P365 – Day 125 party! Juniordwarf and I went to a party at his daycare centre to celebrate the centre’s tenth anniversary in its current premises. He had a great time showing me around, pointing out his friends, eating apple slices (yes kids, he has started eating fruit! 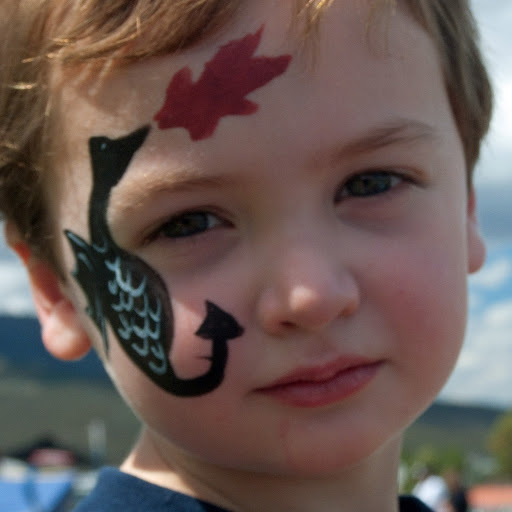 ), jumping on the jumping castle and getting his face painted. 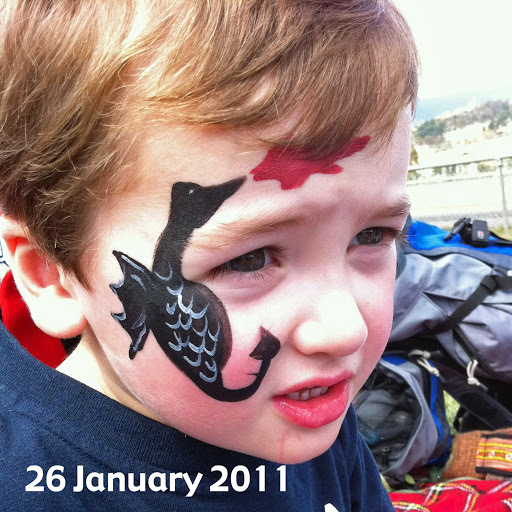 What else do little kids do on Australia Day but go to family days out and get their faces painted? Stop it with the photos, Mum! 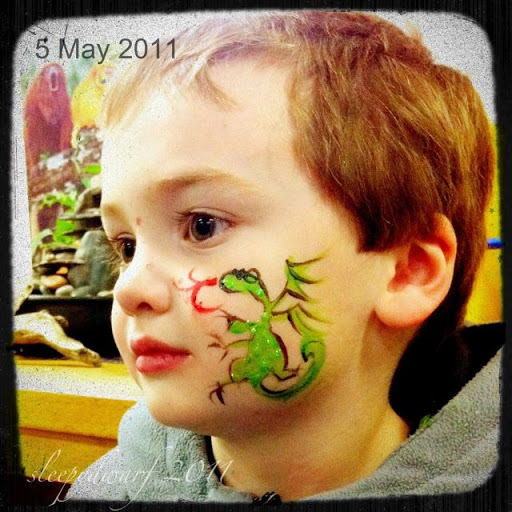 juniordwarf is quite into dragons at the moment, so that’s what he wanted painted on his face. He’s a big fan of Shrek and he loves the scene where the donkey is trying to get away from the dragon. I think his favourite bit from that scene is where the dragon roars, so he loves to roar like a dragon.